This post is an appendix to the journey up Ladbroke Grove I’ve been on in the last two weeks. I won’t bother you with many more of my personal reminiscences but I do remember being struck by Kensal House in the time when I was working in North Kensington and taking the 52 bus home every night to Kensal Rise. Looking down from the upper deck of a bus I recognized the unique character of Kensal House sitting below the level of the road next to the railway. 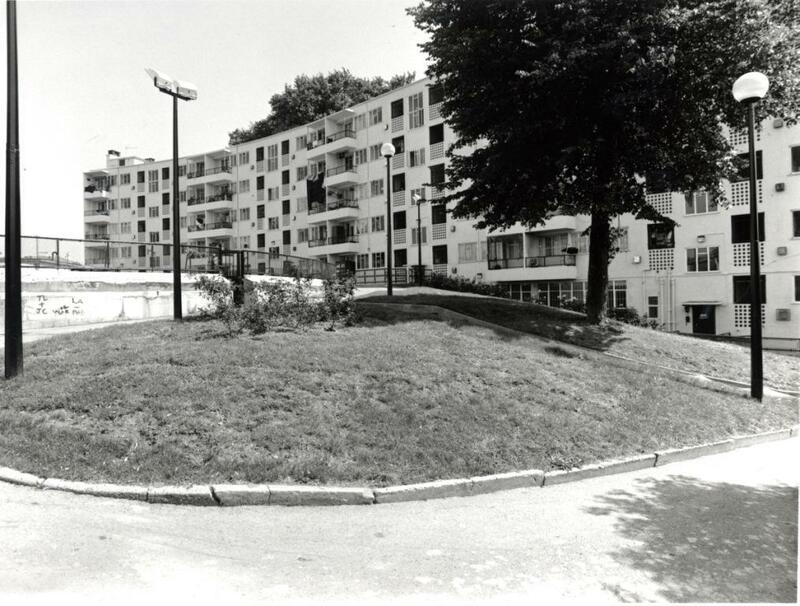 I wasn’t any kind of expert on the architecture of the area then but I could see it came from a more optimistic time than the late 1970s and had seen better days. 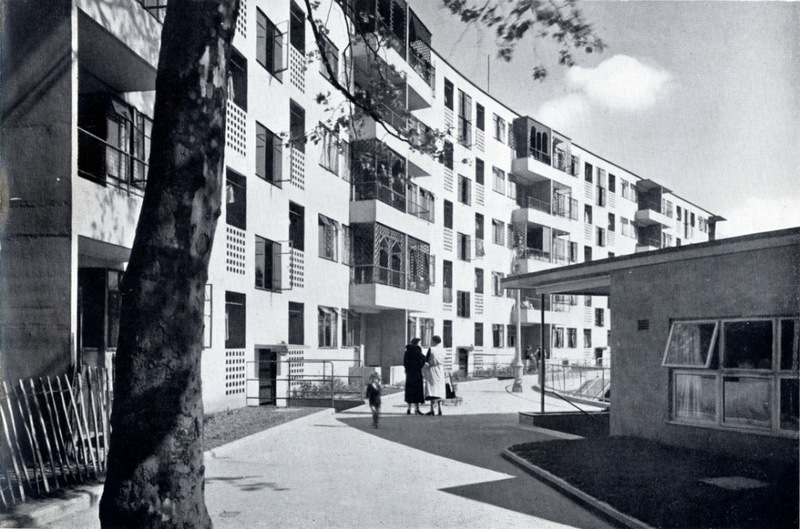 In the 1930s planners and architects were enthused with the possibilities of new forms of housing, and possibly were no longer in thrall to paternalistic Victorian notions of raising up the working classes by improving their living conditions. 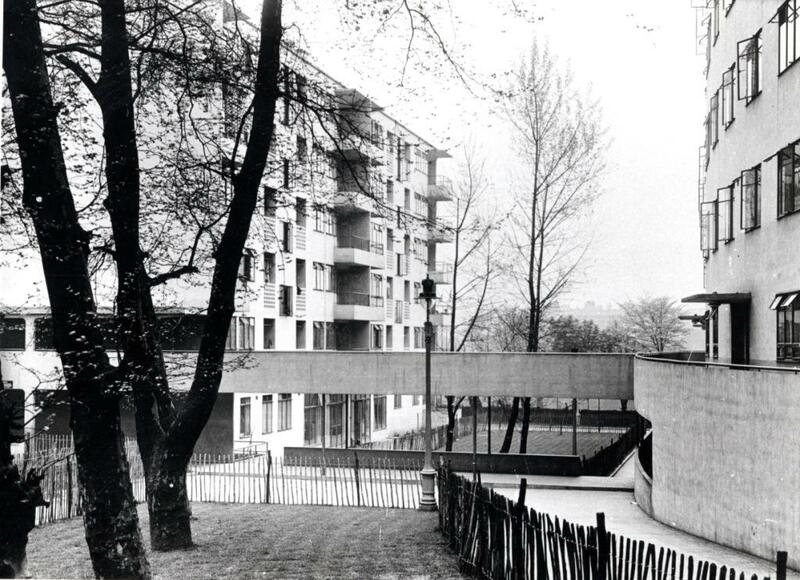 Le Corbusier’s description of a house as a machine for living in was a fresh idea. (from 1923) It was a brave new world of course as of 1931 (although Aldous Huxley’s phrase was ironic). 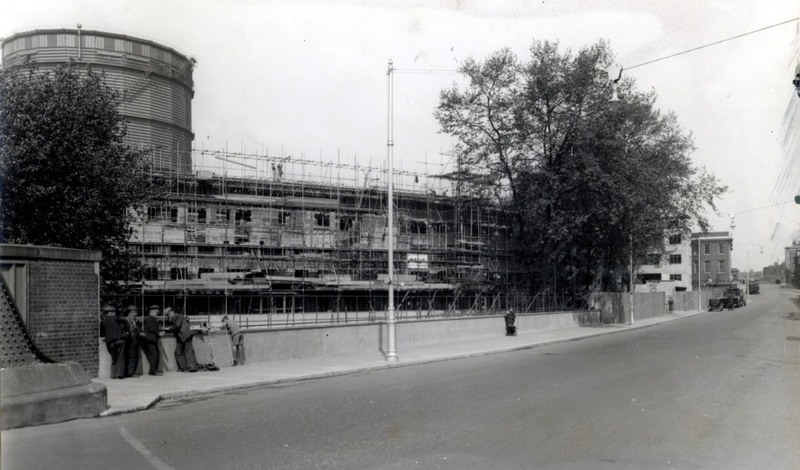 The housing scheme which utilised a no longer needed corner of the Gas Works site was sponsored by the Gas, Light and Coke Company. There was a team of architects headed by Maxwell Fry, with Robert Atkinson, C H James and Grey Wornum (whose work has been on the blog before). They were joined by a housing consultant, Elizabeth Denby. 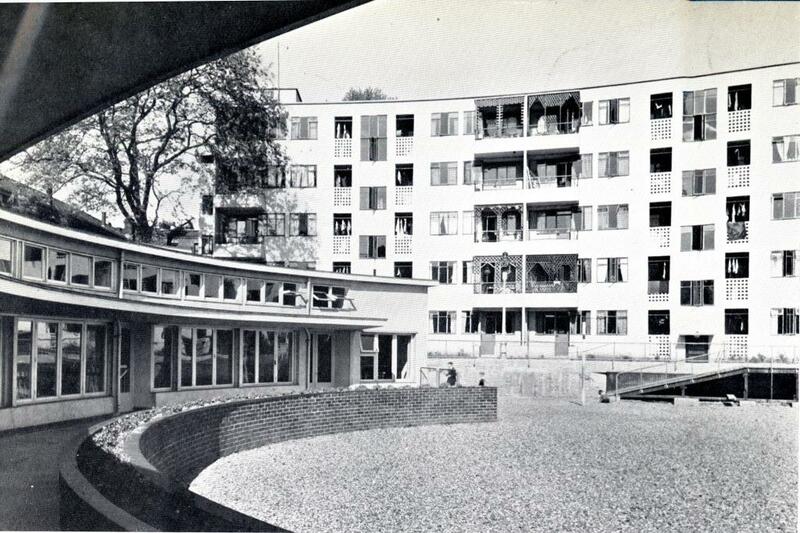 In 1938 Ascot Water Heaters Ltd published a survey of recent developments called “Flats: Municipal and Private Enterprise” which featured the new estate. The consultant to the project, Elizabeth Denby describes it as “the first urban village to be built in Britain“. The design committee also had responsibility for ensuring the new residents settled in and that rent and fuel costs remained reasonable. She remained on the new estate for a while in her consulting role. 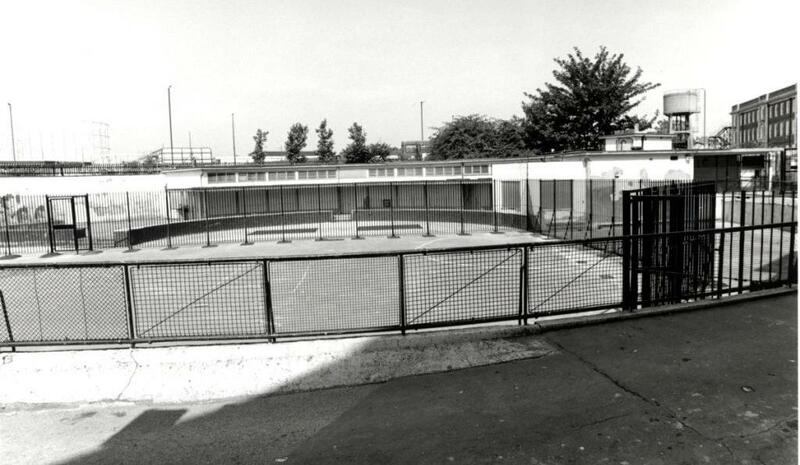 She reports on the success of the Club Rooms and the social club which took in members from the surrounding area, and took particular pleasure in the enthusiastic take-up of the gardening facilities. “On a sunny evening or at the weekend each balcony was its tenants leaning elbows on the rail, smoking, gossiping, happy, like a group of cottagers perched above each other on a steep cliff. 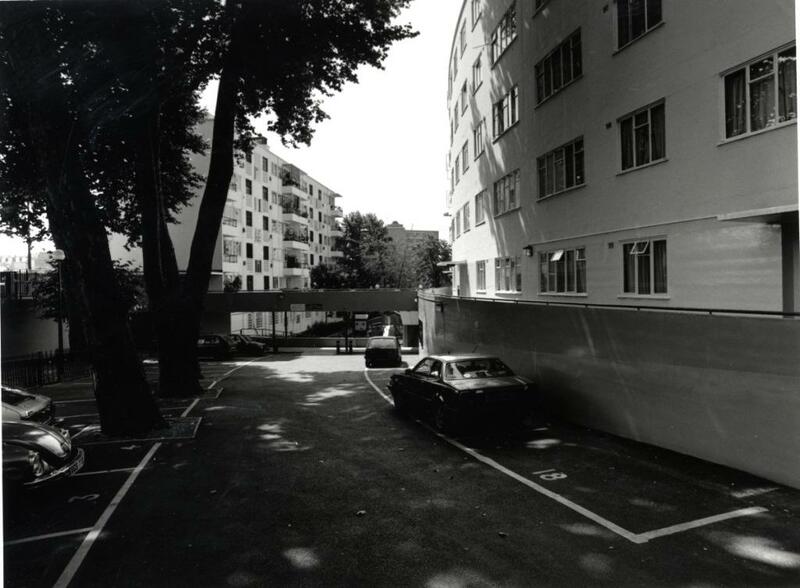 The possession of canaries by some of the tenants intensifies the country illusion.” Again, you can see a degree of condescension in her surprise that working class people responded to improved living conditions by looking after their new homes but the scheme was well-intentioned and did succeed in showing the way forward for planners. 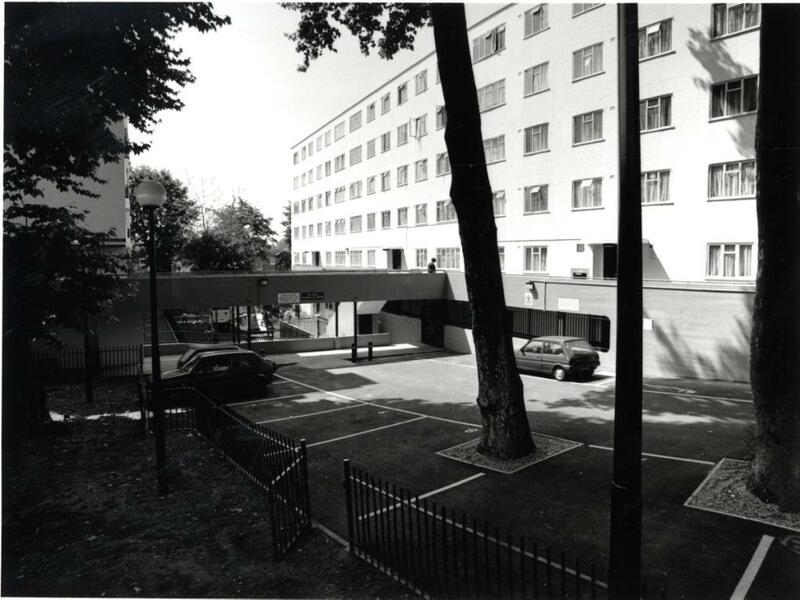 Both Denby and Fry mention the light available in the new flats – big windows, airy spaces, the feeling of a garden. This was an idea that was taking hold in the sun-worshiping 1930s. Sun lounges, gymnasiums, fresh air and exercise. I’ve encountered that enthusiasm for the outdoors in various spheres such as the Bauhaus houses in Chelsea and the dancing philosophy of Margaret Morris. 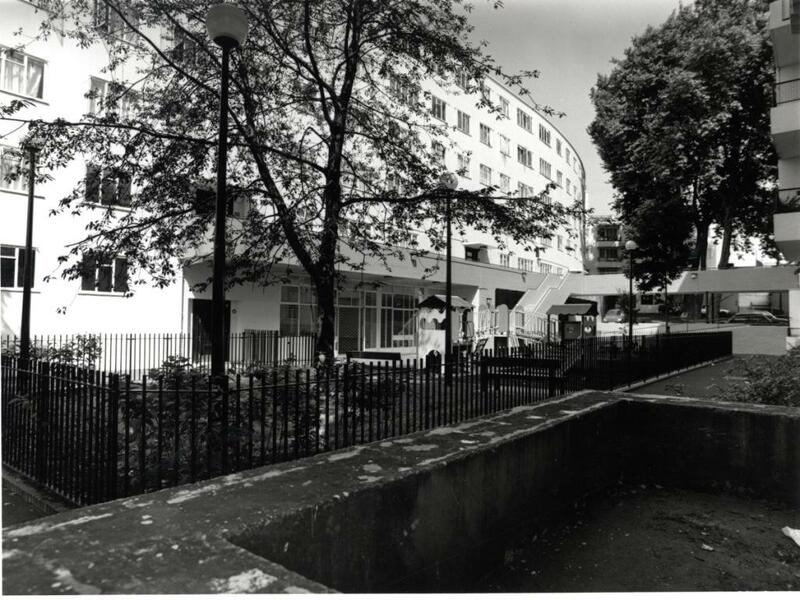 As it grew older Kensal House got a little worn down, as I saw it in the 1970s but its fortune revived and the atmosphere of pleasant living in a garden-like environment is still visible in a set of photographs from 1992. 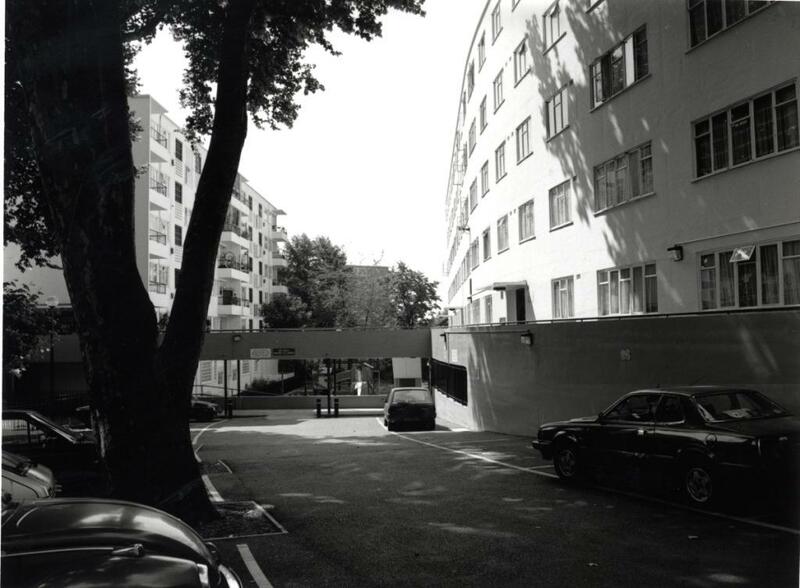 This one and the one below show the same walkway between blocks, possibly even the same trees. So that little pocket of 1930s optimism remained. The gas lamps have been replaced as in this view of a grassy knoll, but the sense of separateness is still intact. Behind this picture you can see the same water tower from last week and the site of the Sainsbury’s super store as it was. 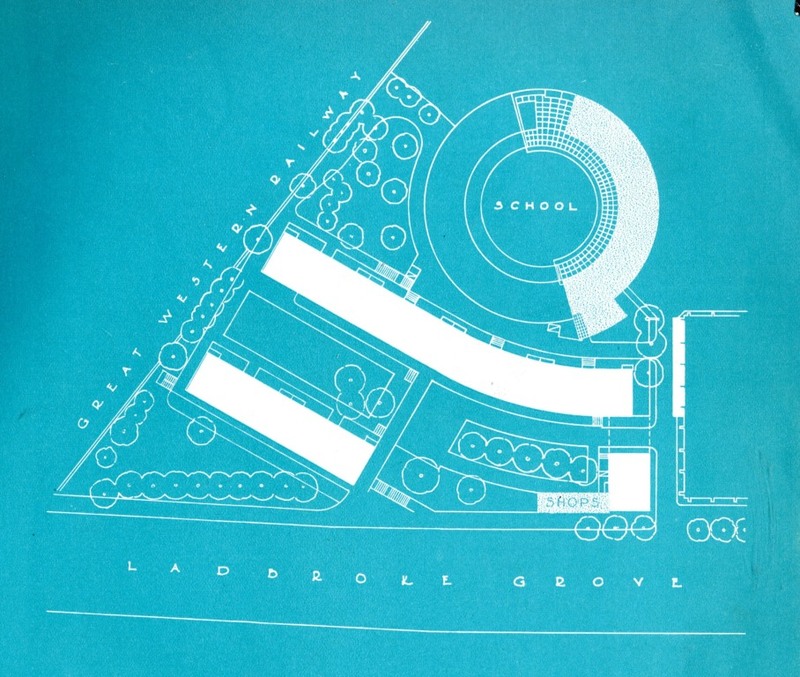 The fenced gardens and the curved facade. The shaded lane between the blocks. 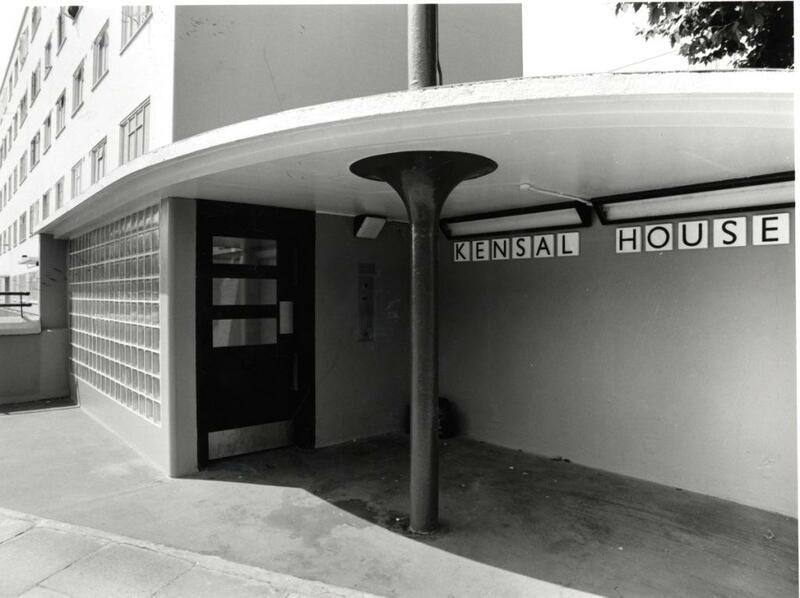 Kensal House (a Grade II* listed building) is still in the architectural text books, still praised as an example of well designed urban development. So Fry and Denby and their committee could claim to have done something useful and interesting on a small slice of industrial land. A little while ago I worked with the SPID Theatre Company on a project they were doing with residents of Kensal House so thanks to them and the residents’ group who visited the library during the course of their project. Read more at their website: spidtheatre.com/wordpress where you can download a brochure about Kensal House. This entry was posted on Thursday, December 3rd, 2015 at 12:01 am	and tagged with Elizabeth Denby, Gas light and Coke Company, George Grey Wornum, Kensal House, Ladbroke Grove, Maxwell Fry, Western Gas Works and posted in 20th Century, North Kensington. You can follow any responses to this entry through the RSS 2.0 feed.